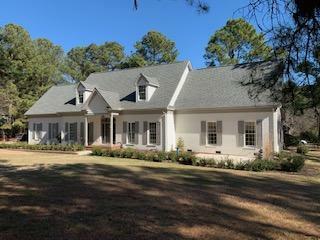 Lovely Southern PInes home in the sought after subdivision of Weymouth Ridge. Fantastic Main level with Formal dining room with built in china cabinet, Large office or formal living room with built in book cases and desk, Leading to the family room with fireplace and doors on either side going out to the back raised patio. The kitchen has granite counters, a large island and SS appliances. the eating area is bright and sunny with windows on three sides and a door that also leads to the back raised patio. The master bedroom with a huge walk in closet and enormous master bath is down stairs. There is a private screened porch off the master bedroom, offering a comfortable place to sit and relax. Upstairs has 2 bedrooms both with their own private bathroom. Plenty of storage in the attic!